The reusable gas-tight Drager CPS 7800 provides excellent protection against gaseous, liquid, aerosol and solid hazardous substances even in explosive areas. Due to its innovative material and the new suit design it offers increased flexibility and comfort when entering confined spaces and working with cryogenic substances. The Drager CPS 7800 (Typ 1b) protects against a multitude of possible dangers when dealing with hazardous substances. The novel antistatic material D-mex™ offers excellent chemical resistance and protection against mechanical influences. The Drager CPS 7800 exceeds the requirements of international industry standards for reusable protective suits. D-mex™, the unique suit material, consists of five layers and its reliability has been proven during hazardous substance deployments by the fire service. Tear-proof textile forms the middle layer; on the inside and outside there is a particularly robust elastomer layer, as well as a chemically high-resistant barrier layer. With this design, the suit retains its full protection performance even if the outer material is damaged. The Drager CPS 7800 increases the wearing comfort even during difficult work in hazardous areas. With its ergonomic cut and five sizes to choose from it offers the highest degree of flexibility for wearers ranging from 1.50 m to 2.05 m in height. In addition, the light and soft suit material adapts ideally for a full range of movement. Offered as an option, individually adjustable braces provide even greater wearing comfort to the user and an improved fit of the suit. A newly designed fit means you don the Drager CPS 7800 with more ease, can put on and remove the suit by yourself, and shut the zip fasteners without assistance. Time and expense for regular testing could be reduced significantly through innovative materials and new service concepts. The suit can also be cleaned and disinfected automatically without complications. This reduces the effort required to keep the suit ready for use over its lifetime of up to 15 years. An unused suit with face cuff can even be stored for five years without servicing. If repair or maintenance is required, this can be performed by the service technician. Of course, DragerService is equally happy to perform these tasks. With optional accessories, the Drager CPS 7800 can be adapted to be even more individual to meet your specific requirements and in turn extend your deployment options further. The suit is available with an integrated Panorama Nova full face mask or face cuff. Stress reduction, especially during prolonged use, can be achieved by equipping the suit with ventilation systems. The Drager CPS 7800 features an optional ventilation system with the integrated regulating valve PT 120 L that can be connected to different breathing air sources. The suit can also be printed with a customer-specific design, if desired. 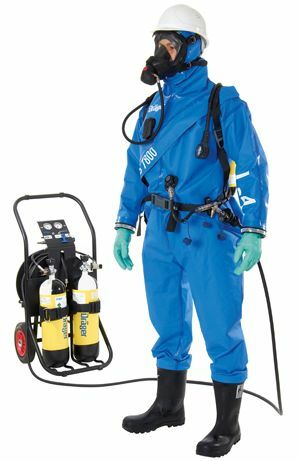 The Drager CPS 7800 training suit permits you to perform exercises in realistic scenarios outside contaminated areas with the same equipment characteristics.